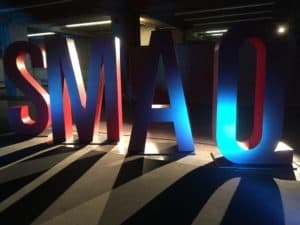 Salon des métiers d’art du Quebec (SMAQ) took place December 6 to 16, 2018. It was the 63rd annual show in downtown Montreal at Place Bonaventure. This was the first time the Saskatchewan Craft Council has attended this fine craft market, thanks to the support of Creative Saskatchewan. SMAQ was an was the ideal venue to showcase the talent of three Saskatchewan Craft Council professional craftspeople: Sherri Hrycay of Sova Design Millinery, Kathleen O’Grady of grady bleu, and Mary Lynn Podiluk Art Jeweller & Goldsmith to promote their businesses to a Quebec audience. The Saskatchewan Craft Council booth entitled “Wear Saskatchewan / Portez la Saskatchewan” sparkled. The theme of the SCC booth played on wearable fine craft and where the craftspeople are from. Our SCC booth was greeted with big smiles from the Montreal community. People walking by were excited to see our booth for the first time at this show. They would stop, squint at the sign above and say “Saskatchewan? You have come from very far away to attend!” Intrigued, they would get closer to see what we had brought with us and to ask questions en français. The public was impressed with our bilingual signage that explained in more detail what we could not pronounce and we were even given language lessons from time to time; which was a fun and educational exchange. Interestingly a retired Linguist happened upon our booth. She was really taken by Mary Lynn Podiluk’s work which, coincidentally, is inspired by linguistics. She noted that all of our translations looked perfect and that she really appreciated that they were in French and grammatically accurate! Visually, our three members’ craft spoke for itself; charming attendees through design, bold colours, varied textures and materiality. It was very apparent to all that not only were Kathleen O’Grady, Mary Lynn Podiluk, and Sherri Hrycay highly creative people, but they are also very professional and disciplined in the development of their individual craft practices as a means to achieving a very specific aesthetics and beautifully finished products. Kathleen O’Grady took a lot of care in explaining her natural dye process to customers. All of ther wool and linen scarves were presented so beautifully in an array colours reminiscent of fresh spices and refreshing gelato ice cream. Attendees couldn’t resist the chance to feel them and then wrap them around their shoulders. “I came away from the event feeling grateful for the opportunity of attending this incredible and historic craft market of such high calibre,” writes O’Grady. Artisans from across Canada, but primarily Quebec, took part in the eleven-day market. There were 400 booths that featured work of every craft discipline. I was very pleased see the comradery between artists at the event. Many artists who had been going for decades mentioned how they actively work together in their various communities to promote the history and value of traditional craft-making that has been passed down over generations. The attendees had a deep appreciation for one of a kind fine craft, as well. Many visited the SCC booth a few times over the course of the Salon. They sometimes came back to say how happy they were with their purchases and that they would be so thrilled to see us at SMAQ again in 2019.